If you’re like me it can be very difficult to relax. We live in a society and time in history where we are pressured by so many things throughout our day and we stay so busy that we forget to take care of ourselves. The damage it does to our bodies as well as straining our emotions and mental well being can be long term and debilitating. So, what is the answer? Drugs? Alcohol? Have you noticed how many commercials are pushing pills? We have become addicted to prescription and over-the-counter drugs. Very knowledgeable about his trade, very professional, personable. He gets a lot of business from the clients at the doctor's office, because he gives a great massage. I've been seeing him often for a couple years now, and my wife for quite a few. I'd rather see him monthly than be all gnarled up when I get older. I met Steve at the Chiropractor's office, finding that massage therapy provided a better adjustment. My husband and I began seeing Steve for massage appointments periodically to remove soreness and tension. 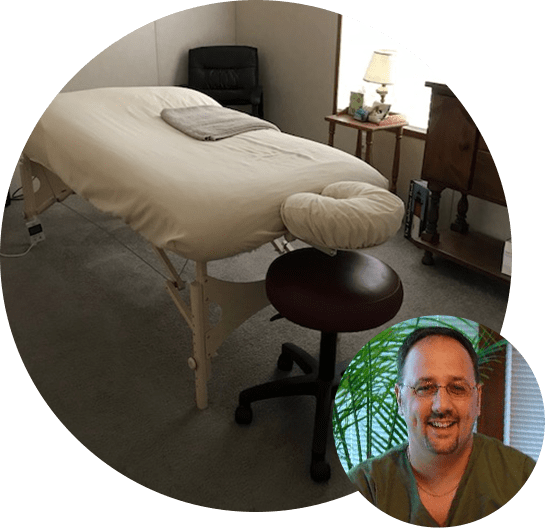 Steve gives a terrific massage, working knots out of muscles, loosening up tendons and ligaments that are too tight, and providing a relaxing massage. Whether loosening my neck and shoulder area, lower back, or knees and IT bands, Steve is terrific! My studio is in my home and there is a shower available if needed​. I give legitimate / non-sexual massages. Since I am now widowed and live alone I will only work on ladies if they bring a friend/spouse with them. © Copyright 2019. Body Works by Steve. All Rights Reserved.